Whether you are planning on going on a short trip or a long ride, it is important that you have a saddle bag to put your essentials and valuables in. These intelligently designed bags can safely hold anything from your mobile phone and house keys to drinks, a spare clothing, and a first-aid kit. That being said, it is essential that you put in enough effort to finding the best horse saddle bag that you know would match your every need and preference. While you can also make your own, the equine industry offers a vast selection of these bags in a wide range of sizes, style, and prices. When looking for the best horse saddle bag, you need to consider a lot of factors ranging from the materials used, size, color, weight capacity, and design. Luckily for you, the equine industry has a lot of these saddlebags that you can choose from. This article was carefully written to provide you a head start on your search for the best horse saddle bag on the market today. It contains every little detail that you would need to know about the Cashel Deluxe Horse Saddle Bag. One of the major factors that you would need to consider when looking for a horse saddle bag is how durable it is. Going on a horse ride, regardless if it is a short or long trip, requires you to have a reliable bag where you can store your stuff in securely. The Cashel Horse Saddle Bag is made of a quality 600-Denier polyester fabric, which means you can depend on it to last for a long time. This saddle bag is intelligently designed to ensure that it is angled perfectly when attached on to the horse saddle. It has overall dimensions of 14 by 13 by seven inches, providing you with enough storage without being too bulky. This product weighs no more than 1.4 pounds. The way with which the saddle bag is to be secured on to the horse is also another aspect that you would need to consider when looking for one. With the Cashel Deluxe Horse Saddle Bag, you will find a set buckled straps to hold the bag in place. There is also a hook-and-loop strap in a unique design that you attach around the pommel. This horse saddle bag has specially designated pockets for two water bottles, a camera or cell phone, and many other valuables. Additionally, the pockets are also insulated to keep your drinks cool or your lunch warm for an extended period. Aside from the Cashel Deluxe Horse Saddle Bag, there are many other products that have the same features which can be found both online and at local shops. For example, we will look at the Lami-Cell Small Four-Pocket Pommel Bag. Similar to the Cashel product, this horse saddle bag is made of a 600 Denier polyester fabric, making it hard-wearing storage that you can rely on for years to come. This saddle bag is also PVC-coated, which added to its resilience. It comes with two pockets on both sides, where the bigger one is zippered, and the smaller one has Velcro strips. The Lami-Cell Small Four-Pocket Pommel Bag is very easy to handle. In fact, you can open and close the pockets using only one hand. This bag can also withstand getting wet and dusty, making it a good choice of storage for whatever weather you plan on riding in. Yet another product similar in features to the Cashel Deluxe Horse Saddle Bag is the All-Around Thermal Horn Bag from Kensington Products. This model comes in nine different variations including black ice plaid, braided blue, citrus plate, deluxe red, and patriot plaid. It is made of a durable ballistic Nylon fabric designed to fit over the horn effortlessly. 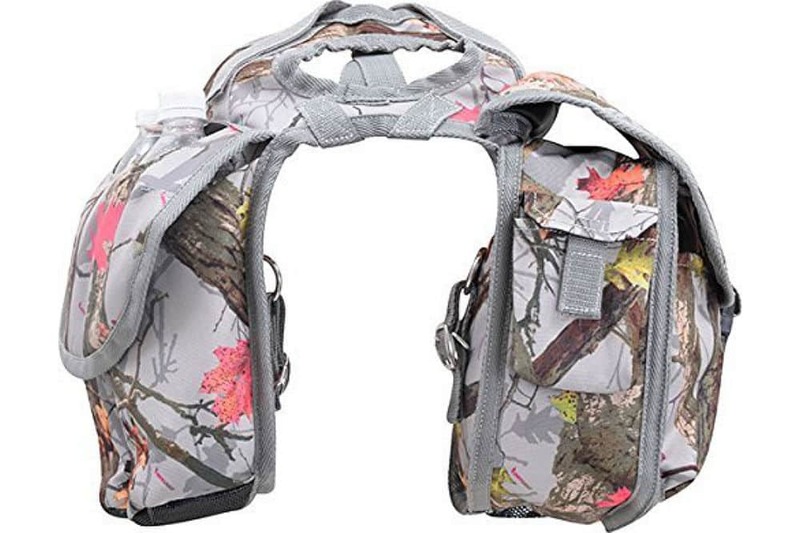 It is equipped with two insulated pockets on each side to keep your drinks or food in as well as a camera or cell phone storage. The seams are all reinforced to ensure durability and strength. Overall, this product measures 15 by 10 by five inches, which means it has enough space to carry all of your valuables. This item weighs no more than 1.4 pounds. The vast selection of horse saddle bags that are available on the market today can be rather overwhelming especially if you do not know what you are looking for. Among the three saddle bags above, we have concluded that you will get the most value for money if you invest in the one designed and manufactured by Cashel. This saddle bag is made of a high-quality 600-Denier polyester material, making it very durable. With this bag, you can enjoy a warm meal or a cool drink even when going on long rides because of its insulated pockets. It also has specially designated storage for your cell phone or camera. This Cashel saddle bag has quick-clip buckles that would allow you to secure it to your horse securely. It is also specially designed to fit over the horn without any difficulty. All in all, you can be sure that this bag will be your companion for many rides to come.